After reading a bit of the literature and research on paraffin candles and their emissions while burning, I am not the least bit worried about burning a paraffin candle, not that I am likely to, being partial as I am to beeswax and now bayberry wax, but if for some reason the beeswax and bayberry dried up and the power went out and I needed light, I would set a match to the paraffin candles left over from my paraffin-candle-burning days. One thing must be clear: These are unscented candles. Scented candles make my eyes itch, my nose tickle, and I always end up sneezing. Many scented products have this affect on me. And research bears out that scented candles are a culprit of sorts—their emissions consistently showed higher levels of this, that, and every other thing you’d rather not have building up in the air you breathe, and scented candles are more likely to produce soot. But nothing I read led me to believe that unscented paraffin candles would harm me in any way as long as I burned them responsibly, meaning out of drafts, keeping the wick trimmed, keeping the flame away from flammable material—all the usual cautions. That said, I have only read what I could find for free online, and at a certain point I had to stop, so I have not covered the whole gamut of what may be out there. But, with that said, those who I see claiming that paraffin candles are toxic are not linking to any research I have not read (if they are linking to any research at all), and, that said, I am not a chemist. Understanding some of the terminology and numbers and particulars in these studies is beyond me. But, thankfully, some parts are written in plain English. Lead wicks aside, consumers are also exposed to concentrations of organic chemicals in candle emissions. The European Candle Association (1997) and Schwind and Hosseinpour (1994) conclude that there is no health hazard associated with candle burning even when a worst-case scenario of 30 candles burning for 4 hours in a 50 m3 room is assumed. However, burning several candles exceeded the EPA’s 10-6 increased risk for cancer for acetaldehyde and formaldehyde, and exceeded the RfC for acrolein. Once again, the RfC and EPA’s 10-6 increased cancer risk guidelines are not designed specifically for indoor air quality issues, so these conclusions are subject to interpretation. The studies mentioned were conducted with paraffin candles. The EPA paper also introduces us to soot. Black soot is the product of the incomplete combustion of carbon-containing fuels. … ¶ Scented candles are the major source of candle soot deposition. Most candle wax paraffins are saturated hydrocarbons that are solid at room temperature. Most fragrance oils are unsaturated hydrocarbons and are liquid at room temperature. The lower the carbon-to-hydrogen ratio, the less soot is produced by the flame. Therefore, waxes that have more fragrances in them produce more soot. In other words, candles labeled “super scented” and those that are soft to the touch are more likely to generate soot. We’ll return to soot later. It has been found that wax quality strongly influences the air pollutant emissions. The Schwind and Hosseinpour study mentioned in the EPA paper comes from Germany. It has the unwieldy title “Determining and Evaluating the Emissions of PCDD/PCDF, PAH and Short-Chain Aldehydes in Combustion Gases of Candles.” For what it’s worth, PAH is “polycyclic aromatic hydrocarbons” and PCDD/PCDF is “polychlorinated dibenzo para dioxins/polychlorinated dibenzofurans.” But please don’t quote me on that. The study looked at waxes, wicks, emissions, and toxicity. Even with an assumed “worst-case scenario” and allowing for governmental limits and specifications, the toxicological evaluation arrived at the result that the examined candles do not cause any additional health risk. 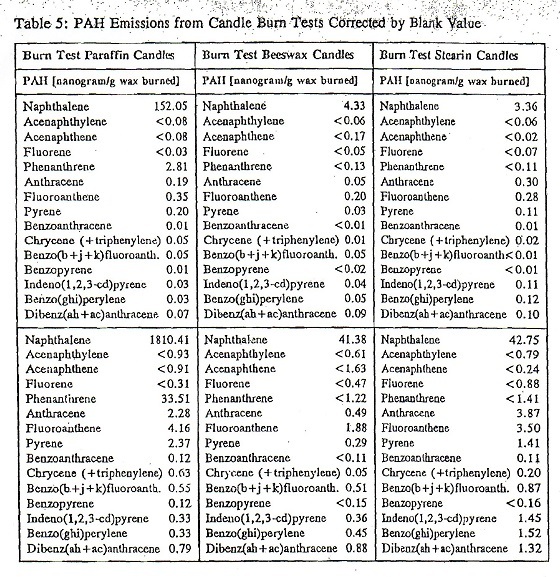 Although the beeswax used for the candles showed higher PCDD/PCDF and chlorophenol contaminations than paraffin and stearin waxes, the PCDD/PCDF emissions in the burn tests, with 4 femtogram/g of wax burned, are the lowest (refer to Table 4). The conditions of combustion in the candle flame were apparently suited to reduce PCDD and PCDF. The corresponding emission values for paraffin and stearin candles range slightly higher. And here is Table 5, a beautiful mass of indecipherability. The conclusion, though, is clear. The next study is odd. What I found is something like a series of progress reports on a study called “Soybean Candles for Healthy Life and Well Being.” The study, conducted from 2006 to 2010, was sponsored by the National Institute of Food and Agriculture (part of the USDA) and was directed by Ruhullah Massoudi, a chemistry professor at South Carolina State University. This project is going to study and address the health problems associated with the use of petroleum based candles and the possible use of its replacement by soybean candles that is claimed to have no harmful emissions. Nowhere in the document did I find citations for the idea that petroleum-based candles are associated with health problems or that soybean candles have no harmful emissions. The second objective is to address the economical feasibility of replacing a renewable source like soybean for petroleum source, which is not renewable and depletes and depends on foreign import. Beyond that, using soybean would bring a healthy economy to our farmers by producing more and better products. Apparently, this research is necessitated because of the health problems related to the use of petroleum based products. By replacing paraffin wax with soy wax in candles, an estimated 60 million pounds of soybeans would be required for annual candle production. This requirement will have a direct economic impact on soybean farmers as well as a health and environmental impact in this country. The burning of soy candles in homes and cars address the real issue at hand, which is the health of American and global consumers. The burning of paraffin candle gives off more toxic fumes than soy candles which may be harmful to individuals. Not a conclusion, mind you, but a project method. And who is burning candles in their car? Indeed, this study garnered “enormous publicity.” Any article about how your romantic candlelit dinner is now toxic stemmed from this study, and the number of times sentences or parts of sentences have been lifted from it without qualification and presented as fact by so-called wellness bloggers and beeswax and soy candlemakers, all to promote their own “healthy” product, is legion. Fortunately, not everybody swallowed this study whole. NPR took a slightly more critical look and talked to Massoudi. The European Candle Association refuted the study outright, and the National Candle Association issued a clarifying press release. So about now I’m thinking this whole “paraffin is toxic” thing was just something cooked up by the soy folks to boost sales. It played extremely well and continues to play well, in part, I suppose, because any product derived from crude oil is an easy target. It is easy to imagine and easy to believe that a product related to gasoline and kerosene and diesel fuel is toxic, harmful, dangerous. And I guess also it is easy to forget that millions of people over several decades have suffered no harm from burning paraffin candles. At the time of this “soybean candle” study, candles made from soy wax had been on the market a dozen years or so. The possible impacts on public health from consumer use of scented candles may include increased risk of cancer, neurological and behavioral deficits and acute aggravation of existing respiratory diseases such as asthma. Most of the risk, he says, comes from the soot that scented candles emit to a much higher degree than non-scented candles. He draws a similarity between diesel soot and candle soot as they “share the same physical and many of the same chemical properties which are believed to contribute to both toxicity and carcinogenicity.” There are existing reference points for diesel soot; there are no such reference points for candle soot. So Krause draws a similarity between the two in order to apply the one’s reference points to the other. Due to the current absence of information on scented candle emission toxicity, and its numerous similarities with diesel exhaust, it would be prudent to tentatively adopt the recognized toxicity values for diesel emissions until specific testing can be accomplished. When the unit cancer risk for diesel exhaust is applied to exposures to candle soot, the estimated increased cancer risk for a lifetime exposure, would range from 9.7 x 10-5 to 3.0 x 10-4 for the lowest emitting candle to 1.5 x 10-2 to 4.7 x 10-2 for the highest emitting candle, using the range of unit cancer risk of 2.9 x 10-5 to 9.0 x 10-5 per m g/m3. If you can tell me what those numbers mean, please email me at PeaPickleFarm@gmail.com. Use of scented candles may contribute significant quantities of pollutants to the indoor environment, especially soot, benzene and lead. Dozens of other compounds were identified in individual candles, but their contribution to occupant risks were not characterized in this limited scope risk characterization. Due to the variability in candles and their respective emission rates, great uncertainty would exist in a generalized risk assessment. Krause’s “Black Soot Deposition: How It Impacts IAQ” (Indoor Air Quality) was published in 2001 by The Refrigeration Service Engineers Society Journal. It is readable and clear as it addresses an increase in the number of complaints about soot build-up in homes received by the Florida Department of Health in the 1990s. Krause explains what soot is (“a product of incomplete combustion of carbon-containing fuels”) and explains that a blue flame indicates complete combustion, a yellow flame incomplete combustion. It turned out that the soot people were complaining about could be traced back to candle usage, and, in particular, the use of certain types of candles and, as well, the manner in which candles were allowed to burn. In effect, burning one of these candles can be equivalent to burning 100 candles at once. It also was determined that a candle placed in an air draft can increase its soot production by a factor of 50. Candles poured into glass jars or ceramic containers. Soft wax containing unsaturated hydrocarbons. Aromatic (scented) wax containing volatile aromatic hydrocarbons. Thick, long wick or one with a wire core. Soot deposits on the mouth of the jar. High, erratic flame when burned. Visible soot emitted from an erratic flame. Located in an air draft created by a fan or a/c vent. Pillar candle with signs of uneven burning or thick, erect wicks. Multiple wick candles with thick, erect wicks. Hard wax containing mostly saturated hydrocarbons. Thin, braided wick that curls over when burned. Tapered and votive candles with thin wicks. Those that have a low, even flame when burned. Initially, soot circulates in the air, potentially inhaled. Eventually, though, soot particles deposit themselves here and there about your home and accumulate on certain surfaces. Soot build-up is described as black streaks on walls, curtains, blinds, or carpets. Krause explains that soot is attracted to cooler surfaces due to thermophoresis, and that soot is also “attracted to electrically charged surfaces … ” … and I ask you, how could this not lead me to think of negative ions being attracted to positive ions? Have you ever heard the story about beeswax candles emitting negative ions that clean the air … ? Could this explanation of what soot does—its attraction to electrically charged surfaces—be at all related to this malarkey about beeswax, negative ions and clean air? Excuse me, alleged malarkey, and, stop me now, because if I get off on that tangent, this will never end. In conclusion, I did not find any evidence that an unscented, well-made, high quality paraffin candle burned responsibly should for any reason detract from your romantic dinner party nor potentially kill off your lover unless, of course, someone gets too excited and knocks over the candle, setting the tablecloth aflame, and blooey, that’s it. I do think there is enough evidence to be suspicious of candles that are not well-made, that are made of low-quality wax, that are scented. But, if the emissions, whatever they are, of a particular candle you are burning aren’t bothering you, why worry? Open a window once a while. Make sure you get plenty of fresh air. And if you notice soot building up in your home, make some changes.